Location: The Connecticut River beginning in Rocky Hill, CT and finishing in Essex, CT. Launch from Ferry Park Boat Launch, race to overnight camping ground at Hurd State Park (approximately 16 miles). Sunday racing continuing down the river for haul out and awards party at Pettipaug Yacht Club (approximately 19 miles). Launching: Boats will be launched at the public boat ramp at Ferry Park Boat Launch in Rocky Hill, CT . All boats will be hauled out at Pettipaug Yacht Club, in Essex, CT.
Rules: Run what you brung! Launch your boat, sail fun races, land at the camping ground and continue to race to the awards party the next day. Single hand your boat or bring a partner, but leave enough room to carry your camping gear yourself! You’ll need to carry your own beverages, snacks & lunch for Saturday and Sunday. Exact racing format TBD, recommendations encouraged! LaserPerformance will provide dinner on Saturday night and breakfast Sunday Morning at Hurd Park, and food Sunday afternoon at Pettipaug Yacht Club during the awards party. Transportation logistics: Please note these plans are tentative and subject to change. Change notifications will be posted on the event page on the Sunfish Facebook or communicated through email to those registered. Boats can be delivered on Friday evening to Ferry Park Boat Launch in Rocky Boats are encouraged to be dropped off on the grassy area (without dolly or trailer), to minimize equipment left at the starting point. Otherwise boats can be left on trailers overnight in the parking lot. Security will be provided to watch the equipment on Friday night. Saturday morning vehicles should be left at Pettipaug Yacht Club, Essex CT. Carpool or shuttle will be organized to transport competitors to the launching site, leaving Pettipaug Yacht Club promptly at 8:30am. The 1st warning signal will be at 10:30am in the area south of the ferry line. After racing on Sunday, competitors will haul out at Pettipaug Yacht Club, where they will be able to carpool if necessary to the starting location to collect any equipment left. Please understand competitors are to remove all cars, trailers, boats and other equipment from Pettipaug after awards on Sunday. Competitors Meeting & Racing: Competitors meeting will take place at the launch area at Rocky Hill at approximately 9:45am. Sailing instructions with scratch sheet, safety plan and course chart may be available on the regatta Facebook page and at the Competitors meeting. Racing commences at 10:30am. Classes: Run what you brung! Sunfish, or any mono or multi-hulls that have an accurate Portsmouth Yardstick rating and can be beached (daggerboard/centerboard). If more than 5 One Design boats register before May 25, 2018 that one design class will be added. Eligibility: Open to all, written permission from parents or guardians required for competitors less than eighteen (18) years of age must be received before the start of racing. Equipment & Class Rules: The racing rules of Sailing 2017-2021 shall apply. All sailors shall carry zipped or tied US Coast Guard approved Personal Flotation Devices (PFD’s) at all times while on the water. Race committee reserves the right to require singlehanded sailors wear zipped full torso wet or dry suits, please prepare accordingly. All boats are encouraged to have a hand-held or fixed VHF radio. 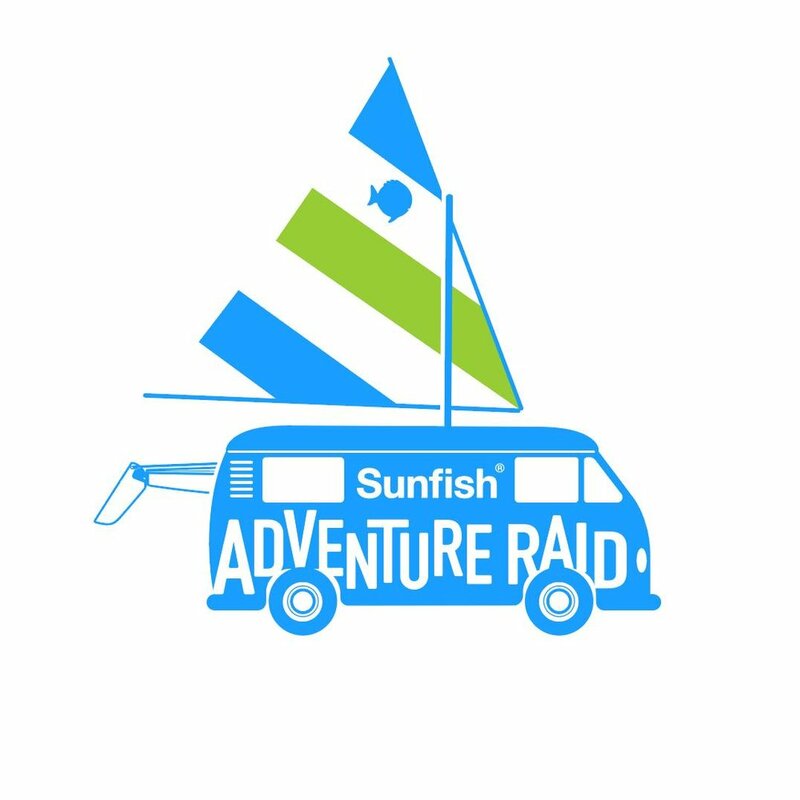 Registration: Pre-registration is encouraged at https://www.eventbrite.com/e/sunfish-adventure-raid-registration-41339154524 - further information can be found on the Sunfish Facebook event page, and email updates will be sent when registered with a valid email address. Entry Fees: No entry fees. Questions: Please like the regatta’s Facebook page to receive updates and other information: @sunfishsailing or email Coco at coco.solsvig@laserperformance.com. Are you interested in participating at the SF Adventure Raid but don’t want to sail? Maybe you can’t spare your whole weekend, come help us throw the party! Contact Coco (email above). We’re looking for individuals to volunteers on-shore and on the water. We’re also looking for volunteer power boats, we’ll cover gas & launching fees, also help with trailer transport! Cooks & baked goods encouraged to identify themselves. This morning, LaserPerformance received positive correspondence from Larry Mass, President of the ISCA. As such, LaserPerformance will be postponing the webinars until further correspondence has been received and reviewed next week. Please stand by. LaserPerformance regrets to announce the cancellation of the “Town Hall” Meeting proposed and planned for January 8th, 2018 between ISCA and LaserPerformance, moderated by World Sailing to discuss in open forum the issues between ISCA and LaserPerformance. The President of ISCA declined to attend any such style of an open meeting and instructed all ISCA members not to attend. Rather, the President of ISCA insisted that he would only attend a “closed-door” exclusive meeting where the President himself would represent the entirety of ISCA membership with all and full authority vested in him. Naturally World Sailing have subsequently recused themselves to avoid any misconceptions. LaserPerformance continues to maintain that an open meeting between ISCA and LaserPerformance moderated by World Sailing, where all stakeholders have an opportunity to participate, in person or by teleconference, would be the most transparent, inclusive and truthful exposure of all issues. It would also be the most effective path to reconciliation where possible and to bridging differences. However, in the interest of all Sunfish stakeholders and more importantly the opportunity for resolution of the principal issues, LaserPerformance has agreed to this “Private Closed-door Executive Only” meeting format proposed by the ISCA President. World Sailing has very graciously agreed to attend this meeting which will now be held on the 8th of January, 2018 in New York City. During this meeting LaserPerformance hopes to debate and discuss all issues with special focus directed towards the differences between the ISCA and ISCO. WEBINAR 2: Monday 15 January 2018 from 12:00 noon to 14:00 EST [NY time]. Details of access to the WEBINAR sessions will be published closer to the date. LaserPerformance hopes to present to all stakeholders details of the meeting of January 8th, 2018, including the agenda, presentations, discussions, deliberations, and outcomes of the “closed-door” meeting in the interests of bringing transparent, open and inclusive dialogue to and with all Sunfish stakeholders. We hope you can attend the WEBINAR sessions and we welcome receiving in anticipation any suggestions for topics to discuss or questions to answer. Registration is open!! Please join us on June 2nd and 3rd for the first annual Sunfish Adventure Raid! An exciting, free, family fun event that takes place on the Connecticut River, sailing from Hartford down to Essex with a LaserPerformance and Maclaren Global sponsored campout in Hurd State Park on Saturday evening. We look forward to seeing you there! For registration please click HERE. It has been recently announced by ISCA President, Larry Mass, that ISCA will not accept LaserPerformance’s invitation to attend an open, inclusive and public “Town Hall” Meeting in New York on January 8th, 2018 to discuss the problems between Sunfish stakeholders and the builder. It is the President’s desire to have a “closed-door” meeting with representation for the class limited to the President himself and to the US NSCA. Without multiple parties in attendance for the “Town Hall” meeting, World Sailing has decided it cannot act as the moderator because it could be construed that World Sailing is choosing sides. Indeed, if ISCA chooses not to participate, there is nothing to moderate. Hence, LaserPerformance will respect World Sailing’s decision and has extended its invitation to both World Sailing and to the ISCA President to attend the “Town Hall” Meeting as a participant or an observer. LaserPerformance intends to hold the meeting regardless of ISCA President’s decision not to attend and stands by their invitation that all Class members and Sunfish sailors are invited to the “Town Hall” in an effort to ensure that all of the stakeholders’ concerns are addressed in a public forum. Per the insistence of ISCA President, LaserPerformance will be attending a “closed-door” meeting with the limited number of ISCA “exclusive” participants. LaserPerformance continues to maintain that an open and inclusive dialogue is not just necessary for the current situation but also a pre-requisite for healthy relations at all times. However, LaserPerformance has submitted to these requests, conditions and stipulations by ISCA President in the hope that any dialogue is better than none. LaserPerformance has invited ISCA to attend a “Town Hall” meeting to be moderated by World Sailing on January 8th, 2018 in New York City. World Sailing has kindly agreed to participate. As a “Town Hall” meeting, LaserPerformance is opening the invitation to any and all Sunfish stakeholders who wish to attend and participate. LaserPerformance’s wish is to be transparent and inclusive in all discussions with ISCA, World Sailing, all Class members, and all Sunfish sailors. LaserPerformance would like any comments, concerns, and questions to be aired in an open floor. Therefore, LaserPerformance asks questions or issues to please be summited via the ISCO website (www.sunfishclass.global) in advance to ensure everything is brought out for discussion. However, any questions or issues raised during the session will naturally be addressed. LaserPerformance will be providing more information on the venue in New York City and other details in the week to come. For all those not able to physically attend, LaserPerformance will be providing an alternative through video conferencing with the ability for mutual interaction. Explore the Shores of the Connecticut River at the Sunfish Adventure Raid! Rig your Sunfish, pack your sleeping bags, and grab a friend!! We are excited to announce the Sunfish Adventure Raid!! After hearing from the sailors, ISCO has revived the format of the Sunfish Adventure Classic as their first regatta in what is to become an annual roaming event for the Sunfish fleet to take any shore. On the weekend of June 2nd, join the sponsors, LaserPerformance and Maclaren, in Hartford for a two-day distance sail down the Connecticut River to Essex. Saturday night will be capped off with a regatta campout in Hurd State Park with an event barbeque provided by LaserPerformance and Sunday after racing, awards and a post-race party for sailors and friends! Stay tuned for more information and registration!! - This is an Intellectual Property (IP) issue and an IP issue only. - LP is the sole builder and owner of the Sunfish IP (marks & logos) worldwide. They are registered and protected at a significant cost. - Previous IP licenses had lapsed so we offered to license our IP rights to ISCA for free for 15 years! And to further support the class with $500,000 in sponsorship over the next 5 years. - After going back and forth for two years and much to our dismay, the ISCA President made the choice to not sign the agreement and to use ISCA resources to fight our IP ownership. We don't believe that ISCA should be getting into fights over IP and should stick to promoting the class and events for their members. - When ISCA would not sign the agreement, we had no choice but to protect our IP and look to a new future for the Sunfish Class on a Worldwide basis with ISCO. - As the sole builder and IP owner, we are committed to growing the Sunfish Class on Worldwide basis and working with sailors to make that happen.